When you pair beauty and low-maintenance in a single type of plant – that is one that I highly recommend. Earlier this week, I was doing a landscape consult with a client who had multiple Red Yucca (Hesperaloe parviflora) plants throughout his garden and I was reminded again, how much I enjoy this succulent plant. First of all, its flowers are beautiful and appear May through September and hummingbirds find them irresistible. Red yucca isn’t only drought tolerant but is hardy to -20 degrees, making it suitable for planting in many different planting zones. Although it often referred to by the common name ‘yucca’ – it isn’t a yucca at all. Even when not in flower, its grass-like succulent foliage add texture to the landscape. I really like how they look when planted in groups of three. **When adding multiple plants of the same kind – focus on adding them in odd numbered groupings such as 3 or 5. The reason is that odd numbered plant groupings are more pleasing to the eye. In addition to the more traditional red/pink colored flowers, there is also a yellow variety available. They are the same as red yucca with the flower color being the only difference. Their requirements are few…. full sun, well-drained soil and periodic deep watering. 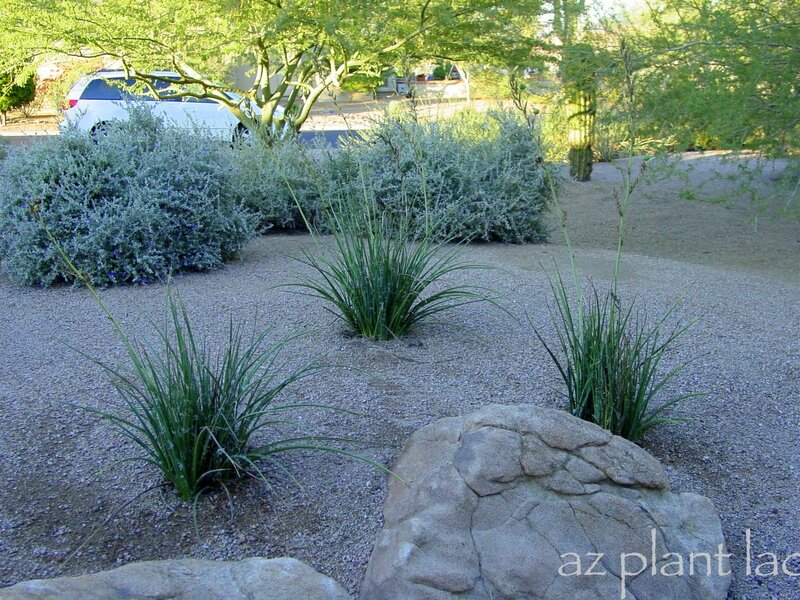 Red yucca plants are extremely low-maintenance. All you need to do is to prune off dead flower stalks in the fall. 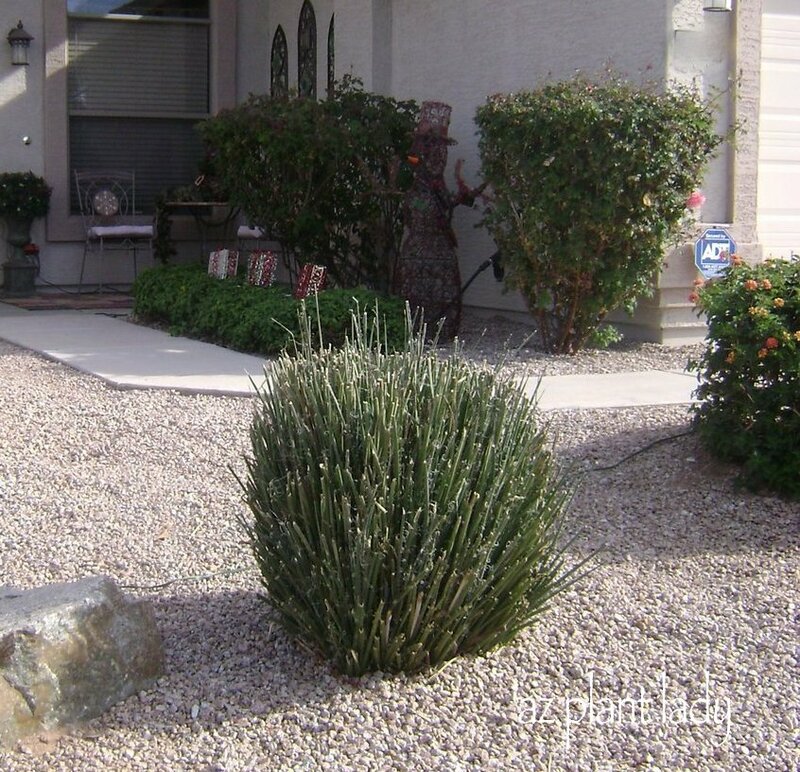 Don’t prune the foliage like the homeowner did in the photo above – why create more maintenance then is needed? Especially when it results in turning an attractive plant ‘ugly’? Red or yellow yucca thrive in areas with reflected sun and heat. They also do well around swimming pools and in pots. I love how this yellow yucca was placed between garage doors, don’t you? It is almost impossible to find a plant that will do well in this unforgiving location. Over time, red yucca can become overgrown. The photo above are from my client’s front yard. 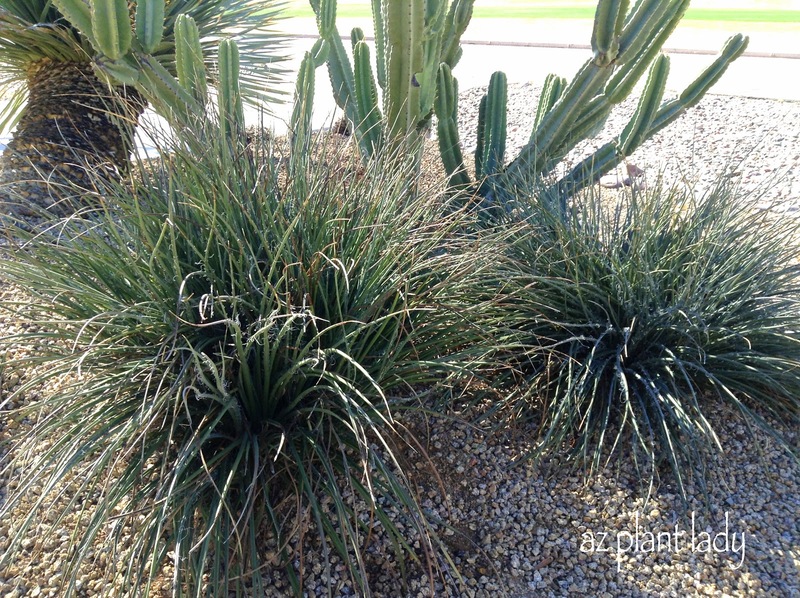 His red yucca aren’t quite overgrown yet, but will eventually get there in 2 – 3 years. What I recommend is to simply take them out and replace them when that happens. You don’t even have to buy a new red yucca to replace them with. Simply separate a small section of the overgrown plant that you just removed and re-plant it. What’s not to love about this fabulous plant? I hope you will decide to try red or yellow yucca in your landscape. What a deserving staple for our SW landscapes. Though I'm always trying to design landscapes without using even one – but hard for me and harder for some clients, who are just now getting on-board with xeriscape. I have to admit that I really like these. And I want a yellow line so bad! All mine are red, and I can find the yellow ones here, other than the ones the city randomly planted in a row of red ones. Thanks for sharing your pictures. When you said 'Yucca' I imagined something huge! My taste must be wanting though because I quite like the look of the trimmed example. Thanks for this article! I fell in love with red yucca on a visit to Austin, TX. Now growing a few from seed in Nor Cal. Can’t wait til they are big enough to bloom? They are truly unique plants with lovely blooms!